I've been using Aperture on a 17" PowerBook, and my biggest challenge hasn't been performance, but disk space. Storing hundreds and hundreds of RAW files on a measly 80GB internal hard drive is insane. Even if I cleaned off my iTunes music, video clips, applications, documents, and the OS itself, I'd still run out of room. I had to find a solution, and fast. So, I did. My approach was to carry with me a 80GB LaCie 80GB Portable External Hard Drive that was slim enough to fit unobtrusively in my laptop case. I then copied my Aperture Library on to the mobile drive and removed it from my PowerBook's internal disk (I recommend that you back up your Aperture Library to at least one other drive before deleting from your laptop). You can instruct Aperture to read the library on the mobile drive by going to its Preferences (Aperture > Preferences) and pointing the application to the new library location. You'll have to relaunch Aperture for the change to take effect. OK, so now you've relieved the pressure off your internal drive, but you've also created an 80GB ball and chain that's necessary to run Aperture. Or is it? One of the lesser-know features of Aperture is the ability to drag and drop entire projects out of the master library. You can use this to your advantage while working on a big assignment. Drag a project out of your master library (from the mobile drive) to your laptop's internal drive. If it's a large project, this will take a minute or two to copy. Now quit Aperture, disconnect the mobile drive, and relaunch Aperture. Since the designated Aperture library isn't available (it's on the disconnected mobile drive), Aperture will create a brand new library on your PowerBook internal drive. Simply drag your project into Projects column in Aperture, and you can continue working on it just as if it were in your master library. 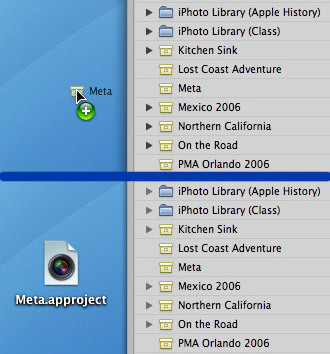 Once you've finished with the project, you can copy it back into your Master library on your mobile drive (replacing the older version of it). There are variations of this technique, but this should get you headed in the right direction. I know this is almost a month old, but I wanted to check something with you before I try this technique. 1. "Simply drag your project into Projects column in Aperture, and you can continue working on it just as if it were in your master library." -- does this create a copy of the project that's on the desktop, or does it move the project into the new library? 2. "Once you've finished with the project, you can copy it back into your Master library on your mobile drive (replacing the older version of it)." -- copy it back into your Master library on the mobile drive from where? And even though the mobile drive is reconnected and Aperture restarted, won't it default to the new library file you created on your built-in drive? I'm just now reading this, but thanks for the tip. I look forward to trying it, especially since I jut purchased a Lacie drive for my Powerbook in which I'm also running Aperture pretty well on. I also thought about getting a smaller drive from Other World Computer which does not require an electrial cord, but I wasn't sure how well it work and if it would be a power issue for running Aperture at the same time. I think that your blog is . I found it on . I will be, check back often.